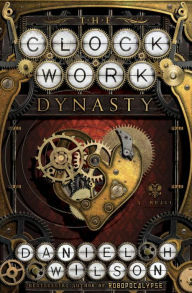 The Clockwork Dynasty by Daniel H. Wilson is a highly recommended blended steampunk/sci-fi thriller exposing the secret history of the avtomat, or automats/robots, living among us. A secret race of robots has been living alongside humans for centuries. The Clockwork Dynasty tells the past and present story of these beings through two timelines, the present day and in 1725 Russia. June Stefanov is an anthropologist who specializes in ancient technology and she travels the world for her employer, the Kunlun Foundation, looking for rare antique automatons. She wears an old artifact around her neck that she inherited from her grandfather. The artifact is reminiscent of an intricate clockwork assembly and her grandfather told her to keep its existence secret. When she figures out how to activate a three-hundred-year-old mechanical doll, she is told the "wolves" are coming for her. She is rescued by Peter Alexeyvich, a robot, from certain death at the mechanical hands of Talus Silferström. Talus serves the avtomat called Leizu, the Worm Mother, who also seeks to kill Peter. Now the two are on the run together as June learns about the secret robots that live among us. Peter's history begins in 1725 Moscow where Giacomo Favorini, the last mechanic of Czar Peter the Great, brings Pyotr/Peter Alexeyvich to life along with his sister Elena Petrova. Peter resembles a tall man, while Elena looks like a girl of around 12. Circumstances force them to flee Russia (when we are introduced to Talus) and travel to London where they struggle to blend into the world of humans. Peter becomes a soldier of fortune while Elena chaffs under the requirement that she stay hidden from humans - and Leizu. Chapters alternate between Peter's story set in the past and the present day with June. I'm not convinced that the alternating chapters worked well here. It might have been good to develop June's character more while condensing the backstory of Peter and Elena. Currently June is undeveloped for a main character; however the novel is certainly set up for a continuation of the story so perhaps the next book will give us more insight into June and her amazing mechanical skills. The writing is very good and there is a lot of fast-paced action to keep both stories moving along quickly. The battles all seem to have a violent, Terminator feel to them and, admittedly, sometimes it became just a bit too violent for me. It is an entertaining novel that shows an influence from other stories/movies, but still should please fans of robot/steampunk fiction.